This August, Pennsylvania’s Red Land Little League team had an opportunity that most kids can only dream about. Their appearance at the Little League World Series wasn’t just groundbreaking for the team though, Red Land also used their national baseball spotlight to give back. The Red Land Little League team raised more than $14,900 for Vs. Cancer Foundation at the Little League World Series. They stepped foot onto youth sport’s biggest stage and represented the Mid-Atlantic Region at the 2015 Little League World Series. It’s not hyperbole to say that this was probably one of the most important weeks thus far in all of these youngsters’ lives. Instead of just the attention of friends and family, it meant national attention, with a myriad of fans in the stands (40,000+ per game) and untold numbers more watching on national television. It was the equivalent of becoming a big league ballplayer before they’re even old enough to drive a car. To sum it up, it seemed like a pretty big deal. But even though the kids from Red Land certainly realized the importance of what was at stake (read: the chance to become world champions and/or be vaulted into the national spotlight, like PA’s most recent Little League star, Mo'ne Davis), they also certainly realized that they had the power to use their unlikely platform to change people’s lives outside of their own, and outside of sports altogether. Red Land���s team chose to use their unique position to support kids battling pediatric cancer. 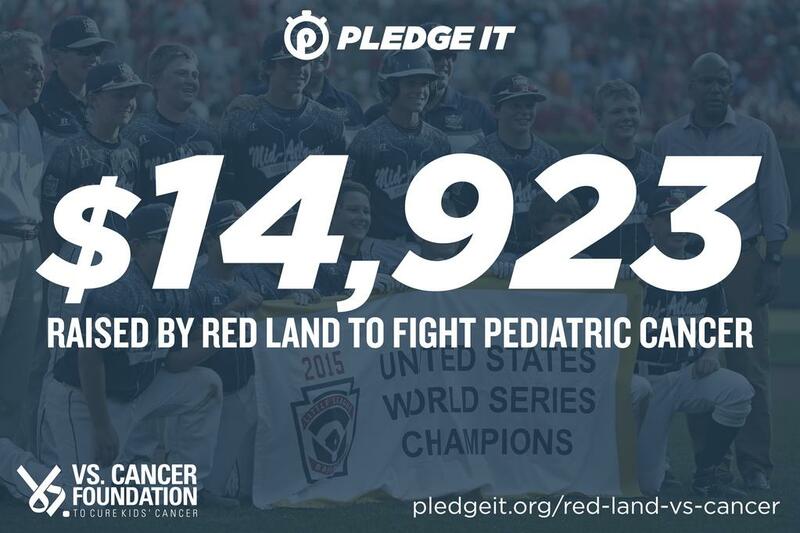 Through their Pledge It campaign to support the Vs. Cancer Foundation, the coaches and players collected pledges for every run Red Land scored during the Little League World Series. Half of the proceeds benefited pediatric cancer research, while the other half benefited the Pennsylvania-based Penn State Hershey Medical Center. The amount of money they raised ($14.9K) was driven by the jaw-dropping number of runs they scored (44 runs in 5 game) on their way to the top of the Little League world. Red Lad finished the summer as U.S. Little League World Series Champs and international runner-up. But they were second to none on the impact they made outside the diamond. This was an opportunity -- not only for the ball players from Red Land, but also for anyone willing to pledge money on their behalf -- to actually change lives in a meaningful way, well beyond the scope of sports, but through sports itself. This was a way to not only enjoy the youthful innocence of Little League baseball, but to support youthful innocence itself. This meant money to improve and save lives, and bring families hope. This meant money to help youngsters get new leases on life. This meant something far greater than the acclaim and spotlight of the Little League World Series. To sum it up, it actually was a pretty big deal. Click here to see Red Land's campaign: https://pledgeit.org/red-land-vs-cancer.